Before I start, here's some stuff you should know about jQuery Mobile. The jquery Mobile library works on top of the core jQuery library. In essence, it is an alternative jQuery UI library which in the Alpha release applies a very iOS (iPhone, iPad) looking styling to elements. 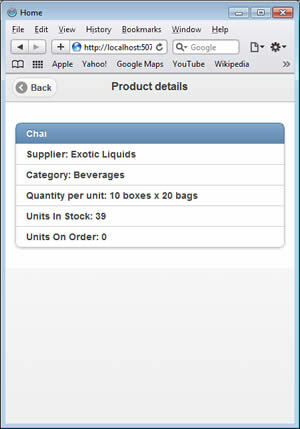 It also makes use of CSS3 and HTML 5 custom data attributes. Consequently, to get the full effect, you need to use a browser which has reasonable support for HTML 5. That effectively excludes Internet Explorer 8 and below. The jQuery team have produced a chart showing how much support they plan to offer for each browser here, but if you want to test your application in a browser, you should use FireFox, Safari, Google Chrome or Opera. Alternatively, you can use an emulator such as iBBDemo2, which is an Adobe Air based application. Finally, you could use IE9, which is in Beta at the moment (and doesn't seem to manage rounded corners that well). IE8 does have one handy use - it can be used to debug your site. Any jQuery Mobile application is designed to degrade in a browser that doesn't support HTML 5 or CSS 3, which means that compilation and runtime error messages are clearly visible in IE8. Razor uses this doctype by default, which makes Web Pages an ideal platform to develop jQuery Mobile sites with. The same is true of ASP.NET MVC 3 if you are using the Razor View Engine, or another View Engine which supports HTML 5. The default doctype for Web Forms is still XHTML 1.1, so if you wanted to create a Web Forms app, or an MVC app that makes use of the Web Forms View Engine, you need to amend the doctype. The content is housed in a div with two attributes: data-role and data-theme. When page is specified as the value for the data-role attribute you are telling jQuery that the content is a View. 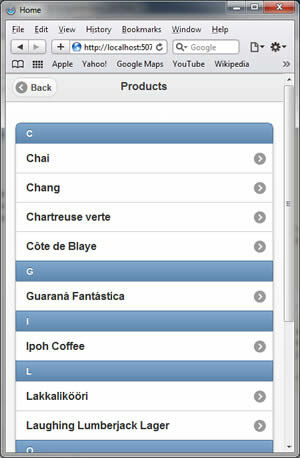 There are a number of themes (styles) built into jQuery Mobile. These are specified via the data-theme attribute. I have chosen the one labeled as "c". The first image shows a bar across the top of the View containing "Categories". This styling is created by applying "header" as a value to the data-role attribute. I have designed it so that the header is part of the Layout, but dynamic so that I can set it from each of the individual pages. If the first letter of the current item in the foreach loop (obtained using Substring) is not the same as the value of the firstLetter variable, print the first letter of the current item. then set the value if firstLetter to the value of the first letter of the current item. This prevents the condition returning true if the next item begins with the same letter. When the next item in the result starts with a different letter, the condition returns false, so its first letter is printed. Options include slideup, slidedown, fade, pop and flip. jQuery Mobile still has a way to go. Support across browsers is a little patchy, but even in its currrent Alpha state, it provides a really powerful UI framework for building cross-platform mobile web sites that look and feel very familiar to mobile app users. Windows 7 users will be a little disappointed with the result because of the lack of support for HTML 5 in IE 8, but they can be persuaded to download and use Opera Mobile until IE 9 makes an appearance. There will be a lot more work done to jQuery Mobile before its full release, which seems to be slated for early 2011.